As long as a particle is moving at uniform speed, and not accelerating, any inertial frame of reference may be selected to determine its speed. The speed of the particle thus becomes arbitrary. It cannot be sensed with eyes closed because it is relative to an external reference. According to the principle of relativity, an absolute uniform speed cannot be determined. 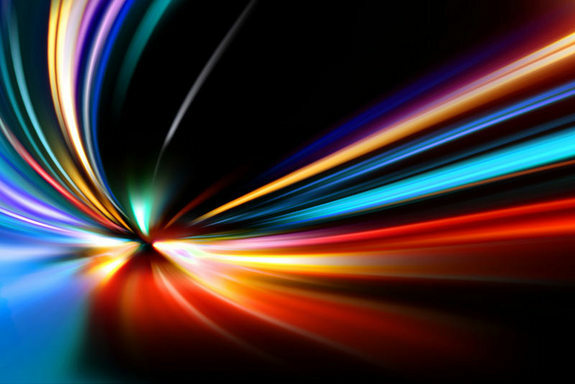 We treat the speed of light as absolute. This appears to be an inconsistency. The case with acceleration is different. It is a change in velocity regardless of what the velocity is. It will be the same in all inertial frames. We can sense acceleration with eyes closed. Acceleration is referenced by itself. It does not require an external reference frame. Acceleration is absolute to the degree that it is self-referenced. Inertia of a particle reduces as it is accelerated. As a particle’s acceleration is increased, there comes a point when inertia has become so small that there is no resistance and nothing to push against. No available push can increase the rate of acceleration any farther. This limiting value of inertia is the same as the inertia of a photon. The inertia of a photon is so small that it cannot be accelerated. The speed of light is uniform and constant because a photon cannot be accelerated. The inertia of a photon is not zero because zero inertia shall correspond to infinite speed. The speed of light has a finite value because the inertia of a photon is non-zero though it is vanishingly small. So, there is a limit to the acceleration that a particle may be subjected to. This limiting acceleration is equivalent to the “rest mass” of the particle, when it is moving at a uniform velocity and not accelerating. The “rest mass” of a photon is zero because it cannot be accelerated from its uniform state. So the real limit for light is the vanishing inertia. The limit on the speed of light is actually the limit on the acceleration to which a photon may be subjected to. In fact, photon is the limit because it has so little inertia that it cannot be accelerated. When you try to push something with no inertia, there is no resistance to push against, so there is no acceleration possible. A particle with mass may be accelerated, but as it is accelerated it requires greater and greater force to increase its acceleration. In fact there comes a point where no amount of push can accelerate it any further. That is the limiting characteristic of the photon. So, this means that as you accelerate a particle, its inertia decreases. It keeps on decreasing with higher and higher acceleration, until it is like the inertia of a photon, and it cannot be accelerated any more. The speed of light, therefore, appears to be a limit, but that is just an appearance. The actual limit is the lack of inertia of the photon. Neither can the photon be brought to rest. As reasoned in this article, rest = no acceleration. It does not mean “no velocity”. In that sense, the photon is always at rest because it cannot be accelerated. For now, I am going to think of EMR as a disturbance of the substance of spacetime. If this becomes unwieldy, I will change. I am going to think of the vacuum of space as the clearsubstance of space. The “photon” or light package disturbs the medium it “passes thru” consistently. Meaning the velocity of the disturbance reacts space at a consistent rate but that consistent velocity depends on the consistency of the medium through it passes. It may come to pass that “dark matter” is found to be simply a dense spacetime. It is another of those mathematical hypothesis, which implies that understanding of basic concepts, such as inertia, is missing. EMR as a disturbance passing through the spacetime of say, clear glass, takes longer, spends more “time” within the spacetime of glass from the viewpoint of the observer outside the spacetime set of the glass. From the viewpoint of the package of disturbance, it neither decelerates upon entering the spacetime of glass, not accelerated upon reentering the spacetime of usual and local space. Clear glass medium is condensed EMR which lets uncondensed EMR propagate through it, but at a different velocity. I see spacetime as the limiting condition of no inertia. It may be looked upon as “EMR of zero frequency” that has infinite wavelength and infinite period as well. It is a neutral field that breaks into electromagnetic fields when disturbed.